The Geneva Motor Show originally kicked off in 1905 and somehow it is hard to imagine what the event must have looked like back then considering that Ford, Mercedes, Renault and a handful of others were only just pioneering the car as a means of transport for all and sundry. Somewhere the records might show exactly how many exhibitors were in attendance back then but we can only assume it would be a tiny number compared to the 200-odd that were showing their wares this year which marked the 84th time the event had been held. Yes we know there are 109 years since 1905 but presumably the odd World War or two got in the way and much of the other political shenanigans that seemed to occupy most of the 20th century contributed to a few of the missing years. Palexpo, where the event is held, is looking a bit tired and dog-eared these days but the convenience of almost falling off the plane steps into the exhibition centre is very appealing. And for those travelling the one-hour-plus flight from London Gatwick a visit to this particular motor show is a very palatable one indeed. The smell of continental coffee and croissants is forever present as you walk through the arcade to get to the main entrance for Palexpo and the whiff of Emmental is a gentle reminder that you have arrived in pleasant Switzerland. All of the accessory and parts suppliers are stuffed into Hall 7 which seems to go on forever until you reach the escalators for the main event on the upper levels. Not sure why the centre has three levels (not floors) because it didn’t appear to be built into the side of a mountain from the outside. Maybe they just like climbing steep things in Swiss land. On to the cars and most of the main European players attend this event plus the big names from Korea and Japan. Surprisingly though only Qoros appeared to be representing China but gut-feel suggests that is merely the calm before the storm. Many manufacturers pick Geneva for their first model launches but even this tradition seems to be a declining one. With the growth of new markets around the globe some manufacturers were referring to a ‘European Premiere’ rather than a ‘World Premiere’ for various models. Wandering around the show and taking in all of the new models on display there was an underlying picture emerging. Cars, for the mass-market at least, are getting ugly. Almost all of the big guns had at least one model that had been subjected to a ‘make-over’ that quite frankly made us squirm. OK the look of a car is a very subjective one but when there are so many Frankensteins on show it prompts a few questions. Is it the ever-pervasive EU with their daft regulations related to car-design that are having a detrimental affect? Has it become fashionable to be unattractive in the car world? Are the car designers on hallucinatory drugs? Sorry but we are not talking about the odd car here and there which suggests that a very broad-brush is being painted with for some reason or another. It’s not even worth listing the culprits but you as the reader will decide in due course whether this might be true or not and besides there were enough stunners on show to distract us from the monsters. KAHN – well-established UK make-over artists for premium brands but this year their stand focused on British prime beef from Land Rover in the form of Range Rovers and Defenders. The seriously sumptuous interiors in the Rangies are a sight to behold and the mean, wide-bodied Defenders look like they could scare off gargoyles. Mercedes Benz – The new S-Class looks sharp and svelte particularly in Coupe form and the C-Class also earned an extra look – much nicer with bigger wheels though. The model choice is becoming mind-bending with umpteen A’s and B’s too so good luck to anyone looking to buy into that category. BMW – the company has now pretty much used up the allocation of numbers from 1 to 8 with the addition of the 2-series and the expansion of the 4-series and again the model choice is dizzying to the head. Prettiest car in the range has to be the 6-series for us especially in Gran Coupe form but sadly the 4-series Gran Coupe looked a bit sterile by comparison. Maybe it was the colour choice for the stand but it just didn’t leave an impression. MINI – a car that is fast becoming a contradiction. It is no longer small or mini-like. It is huge. The new nose stretches the car and the Countryman looks as big as an Audi A3. It just doesn’t look cute anymore but the Clubman Concept looked pretty good. Again, not at all small but the proportions look right and if the final version looks similar it should be a winner. Morgan – a real antidote to all ‘modern cars’. The stand had a cutaway of one of the models showing the solid ash frame which has been used on Morgans since the beginning of time. Surely the EU will declare it as a fire hazard before long to finally remove from the world one of the few companies to still build a car by human hand using proper craftsmen skills. Mansory – Not always a bastion of good taste when it comes to gilding a lily but the metallic turquoise and satin silver Wraith on the stand would have made Rolls Royce proud. It sounds a bit blingy but somehow the colour combination worked very well with the ivory interior and the car deserved a few re-visits from us. Rolls Royce – seeing the ‘new’ Ghost up-close gave a chance to see that RR don’t believe in making radical changes to their cars which is a mighty relief amongst a sea of unnecessary nose-jobs. Previous Ghost owners can rest easy – you need (very) sharp eyes to spot the differences. Maserati – always a joy to see their cars and not a bad apple amongst them. Star of their stand was the Alfieri concept which proved that cars can still be beautiful. Please make that car Maserati and save us from mediocrity. Alfa Romeo – The 4c was much in evidence especially since the Spider is on its way and a white example took centre stage on their stand. Even prettier than the Coupe (without that slightly awkward kink around the B-pillar) it would be unfair to call it a mini-Ferrari but we will anyhow. RUF – how do you make a 911 go faster? Take it to the guys in Pfaffenhausen and they will work their magic to produce a Porsche that will embarrass most other Porsches. No real surprises on their stand this year apart from a canary yellow RCT which is basically a two-wheel-drive Turbo and in terms of power neatly parks itself between Porsche’s ‘basic’ Turbo and the Turbo S model. Alois Ruf also had his own personal Connaught Green 964-based RCT which sadly is not (and maybe never will be) for sale. Lexus – The RCF GT3. Seriously mental. Enough said. The LF-NX concept. Looks great. They won’t make it. Honda – Type R Concept. Just do it Honda and where is the NSX? We are getting very impatient. Renault – A Twizy in Formula 1 guise. So mad-looking they would sell them by the bucket-load if the company accountants were put into solitary confinement. Skoda – Vision C concept. There was little bit of Audi A7 going on from certain angles but the Skoda version would be a hell of a lot cheaper to buy and probably one of the best-looking cars to come out of the Czech factory ever. Gumpert – a brave company that made a comeback from collapse a while back and while their outlandishness should be applauded it is hard to see how the cars will fit in with a new landscape of P1’s, 918’s and LaFerraris. Outdated is probably the word now. The ‘Explosion’ concept is pointless too quite frankly and totally at-odds with the image of Gumpert. Koenigsegg – same comments as Gumpert. In order to survive they need to attract customers away from the new-technology kids on the block but seemingly some people must be buying them. Audi – The new TT is definitely better-looking than the out-going model. There are shades of the original model in the design which is hard to pin-down in any particular aspect but the new car looks good from every angle. The more powerful versions will also increase desirability. 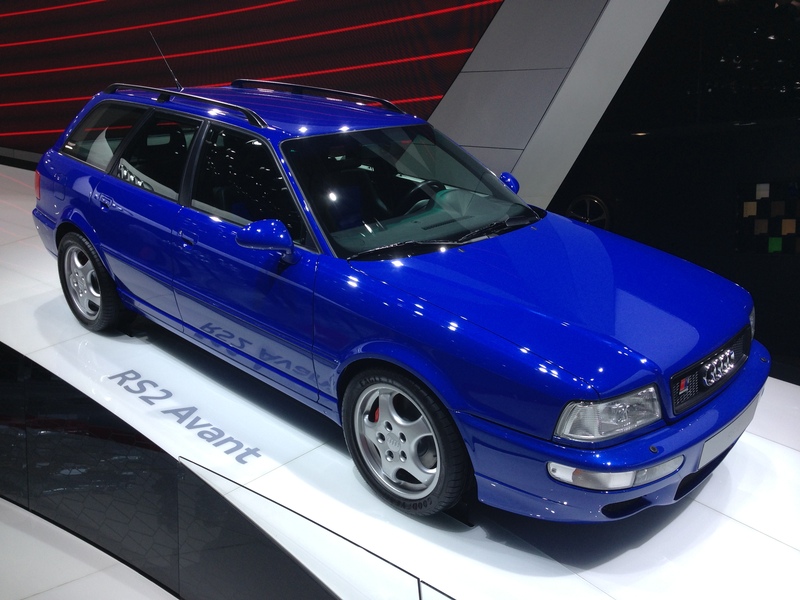 An original RS2 Avant was also featured on the stand which looked a tad old-fashioned next to the current generation RS4 but has nonetheless confirmed its classic status in the history books. Porsche – where was the 918? Not invited to Geneva apparently but the 919 on the stand attracted a big enough crowd anyway. The 911 Targa looks great in the flesh and should be far more popular than Targa models of old. Lamborghini – The Huracan was the car hogging the spotlight on the stand and rightly so too. Not as dramatic-looking as the Aventador but a car that will be purchased surely by looks alone. This car will make buying a 458 a much harder decision from now on. Nice choice of colours on the stand too. Zonda – the maddest, baddest car-maker of them all. Carry on as usual guys. Touring – the Disco Volante (or Flying Saucer) just makes you want to stare at it all of the time. A strange but intriguing shape that draws the eye around the car and although on this outing the car was painted in a metallic green with gold detailing it was as stunning as ever. It is certainly a design that will be talked about for years to come. McLaren – the 650S was having its first public showing and in spite of the presence of an ice-blue P1 on the stand it was pulling its fair share of attention. A curious mix of (almost) P1 front-end and (slightly updated) 12c rear-end the car is tipped to be a big seller for the company. Can’t help feeling that the Spider version pulls it off better than the Coupe – the 12c stays in production by the way. Subaru – the VIZIV2 concept showed that the designers in the back-office haven’t completely lost their way with some pretty dull shapes that have come out of the factory over the past couple of years. Hopefully this concept will point them back in the right direction. Aston Martin – just like Maserati the company still manages to pull a crowd with some of the prettiest sports cars and GT’s available. No big announcements from the company apart from a range of bespoke options for all of the models using the moniker ‘Q’. Might as well milk the Bond connection for all it is worth. Jaguar – probably the loudest stand at the show with a huge screen presenting a short film full of expensive actors, Union Jacks and loud, growly V8’s. One thing Jaguar no longer is and that is understated. The F-Type Coupe of course featured star-billing and deservedly so – it is a very handsome car indeed and could easily hold a candle to the Astons only a spitting distance away. The new XFR-S Sportwagon made an appearance in very un-Jaguar bright blue but if that is where the company thinks its market is then who are we to argue? After all they are still the profitable car-maker in the world. There were dozens of other smaller exhibits worth a mention too but it’s time for a glass of wine and some Swiss cheese now. Ah yes, they also make very nice chocolate too so we’ll have some of that for desserts. In the meantime enjoy our album of images from the show.